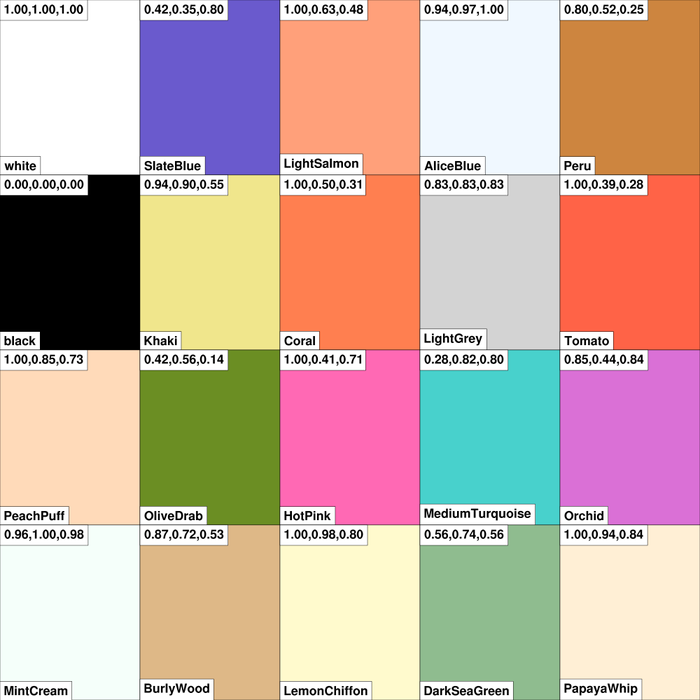 NCL V6.1.0 introduced a new color model, which replaces the concept of associating color maps with a workstation. For backwards compatibility, the old color model is still supported. For more information about this color model, see the RGBA color examples page. 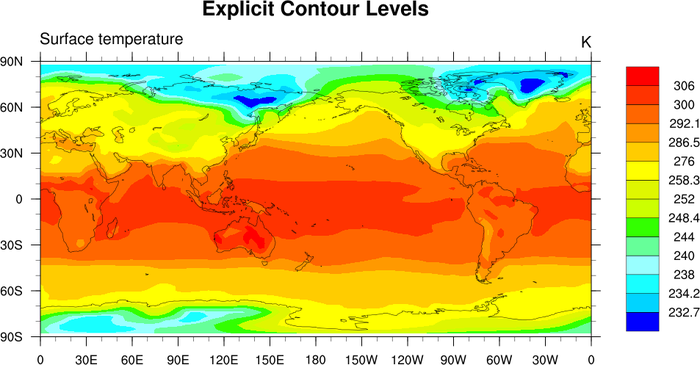 Note: in the descriptions below, the terms "color table" and "color map" are used interchangeably. color_1.ncl: Demonstrates turning on color with the default color map. 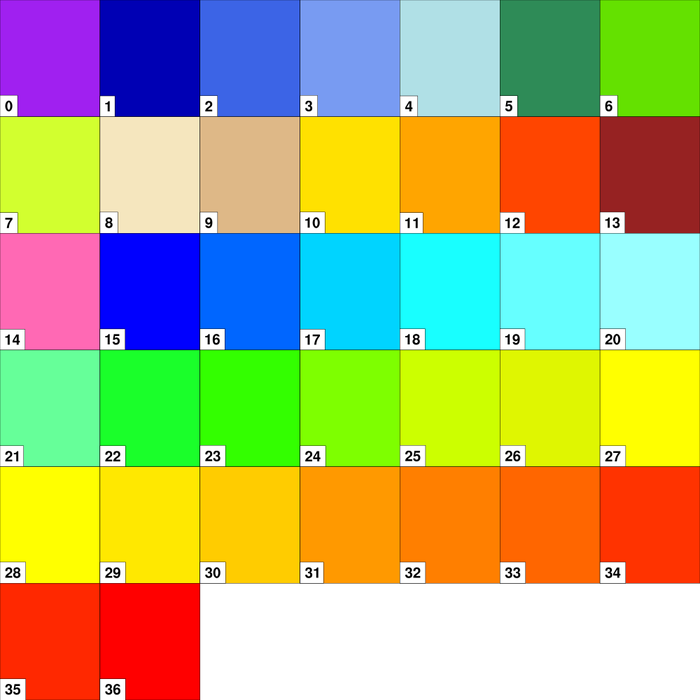 color_2.ncl / color_2_old.ncl: Example of using a built in colormap.There are numerous color tables to choose from. A new resource was introduced in V6.1.0 allowing you to specify a color palette to use with your contours (independent of the workstation color map): cnFillPalette. The cnSpanFillPalette allows you to turn on/off the automatic span of the colors. The color_2_old.ncl script demonstrates the old way (pre NCL V6.1.0) of assigning a color map for color contours. gsn_define_colormap is used to set a colormap for the given workstation. 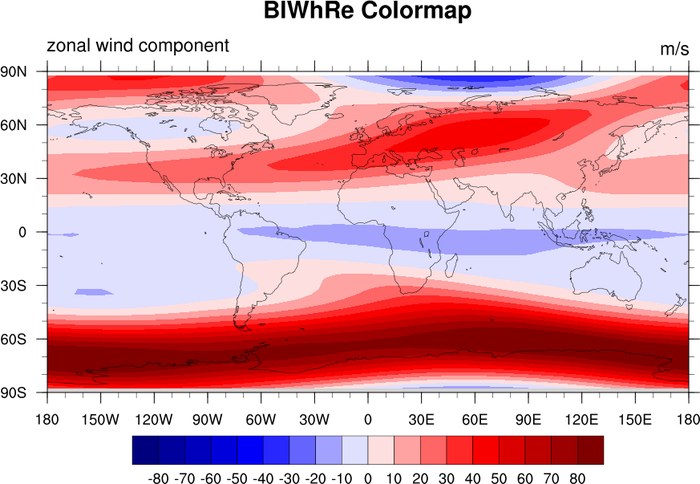 NhlNewColor(wks,0.8,0.8,0.8) adds gray to the color map, which had to be done in NCL V6.0.0 and older. Setting gsnSpreadColors=True forces the color map to be be spanned when creating a filled contour or vector plot. color_3.ncl: Demonstrates how to select just a few colors out of a large colormap and make one of those colors transparent. cnFillColors is the resource used to select what colors out of a colormap you want to represent each contour in the plot. The -1 indicates that the color is transparent. This is not a true color per say but rather the absence of color. As such, whatever color the background is will be seen. 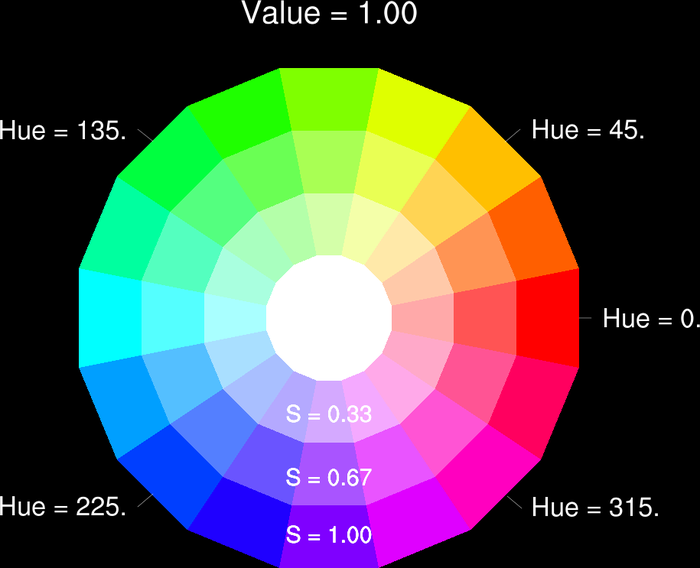 color_4.ncl / color_4_old.ncl: Demonstrates the selection of a color map through individual named colors. cnFillPalette is used to associate an array of named colors for the filled contours. The "color_4_old.ncl" shows the old (NCL V6.0.0 and older) way of doing this, using gsn_define_colormap. 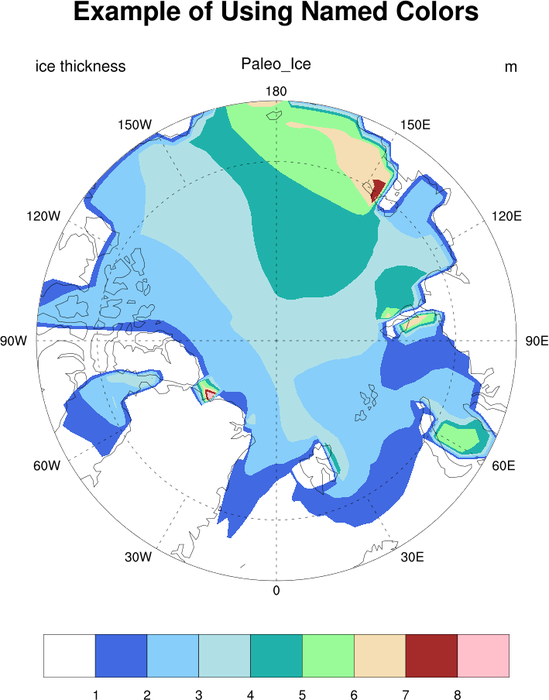 gsn_csm_contour_map_polar is the plot template that draws contours over a polar stereographic map. 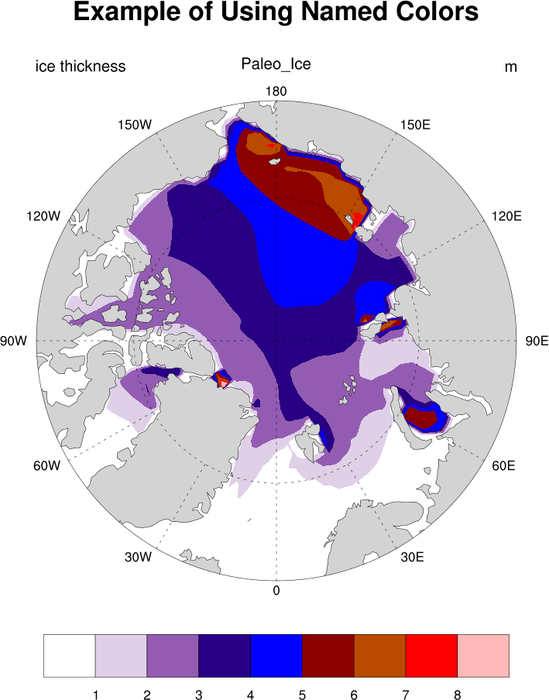 gsnPolar = "NH", Selects the hemisphere to plot. 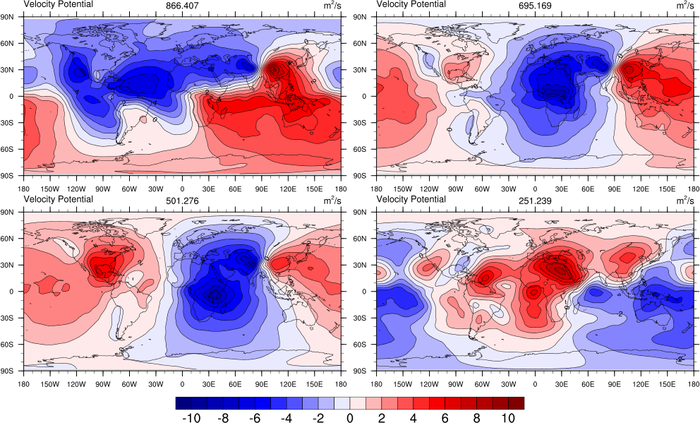 mpMinLatF = 45, Sets the radial extent of a polar plot. 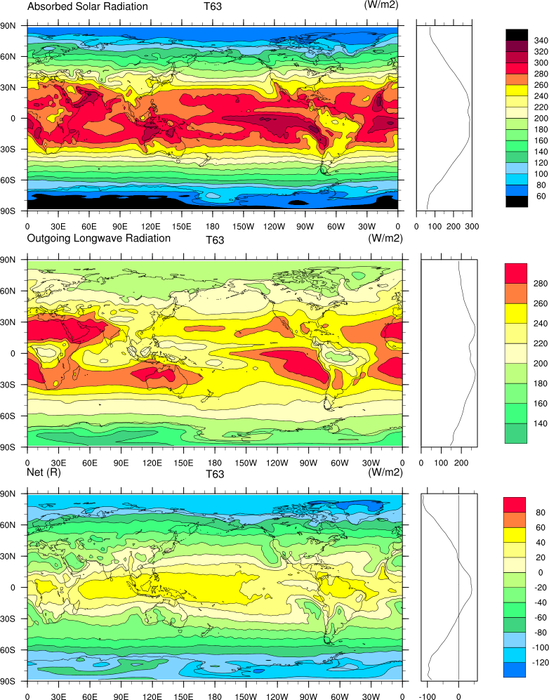 In the southern hemisphere, mpMaxLatF should be used. color_5.ncl / color_5_old.ncl: Creates a panel plot with its own label bar. Note that this resource should be passed only to gsn_panel. You can see other examples of panel plots and common label bars on the special topics panel page. 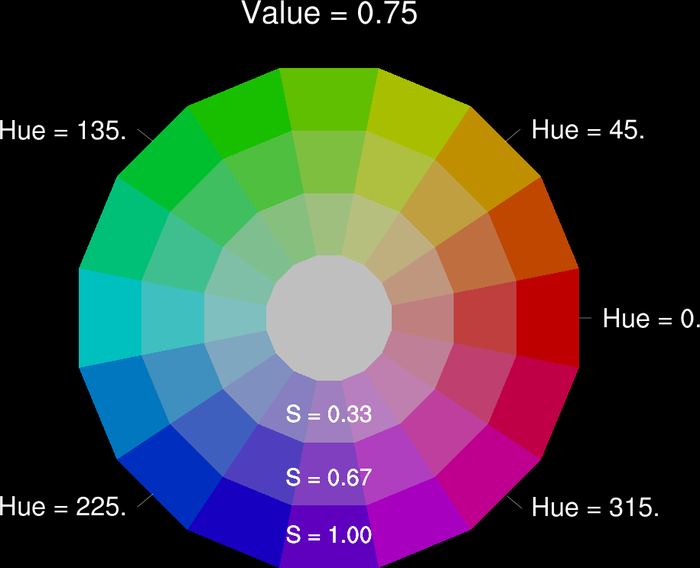 color_6.ncl: Creates a color plot with uneven color intervals. cnLinesOn = False, turns off contour lines. cnLevelSelectionMode="ExplicitLevels", and cnLevels = (/232.7,234.2,238,240,244,248.4,252,258.3,276,286.5, 292.1,300,306/) manually sets the uneven contour levels. color_7.ncl: Another example of choosing from a set of predefined color maps. 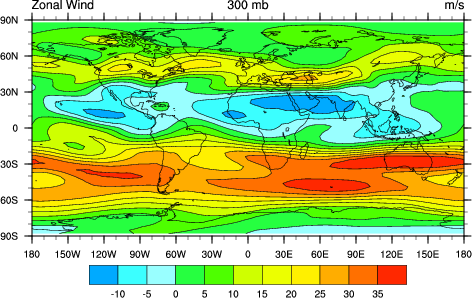 Zonal average automatically calculated and plotted. The label bar is moved from the default horizontal to vertical. 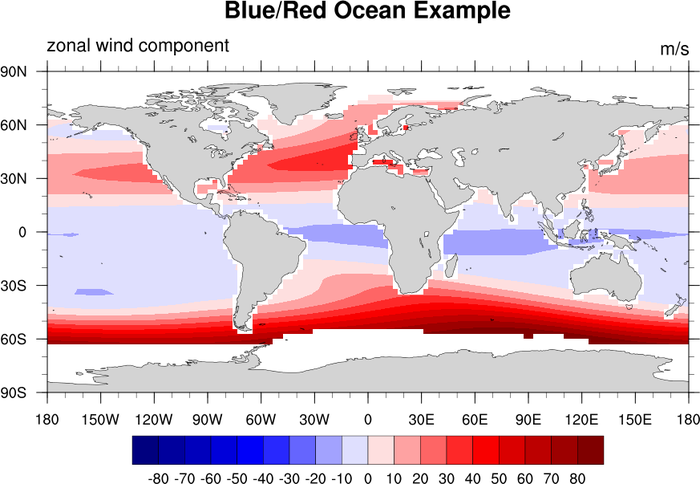 gsn_define_colormap(wks,"uniform"), Selects the "uniform" predefined color map. There are numerous color tables to choose from. lbOrientation = "Vertical", Creates a vertical label bar. gsnZonalMean = True, Automatically calculates and draws the zonal mean of the field. 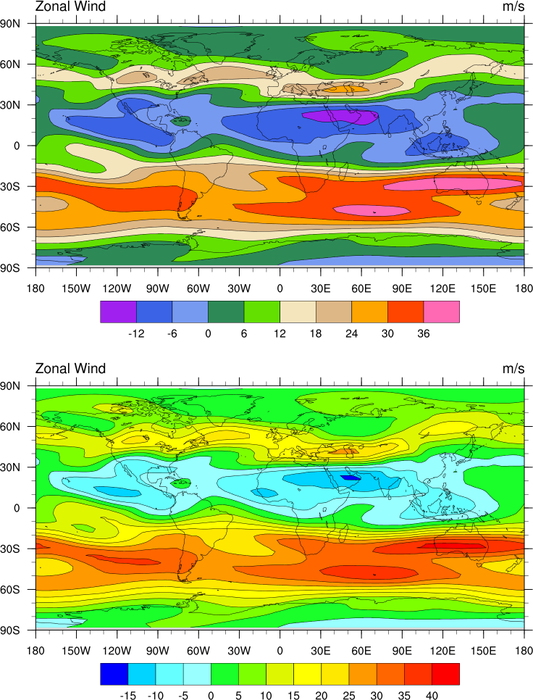 gsnZonalMeanXMaxF and gsnZonalMeanXMinF allow the user to change the axis of the zonal average plot. color_8.ncl: Draws the colormap. 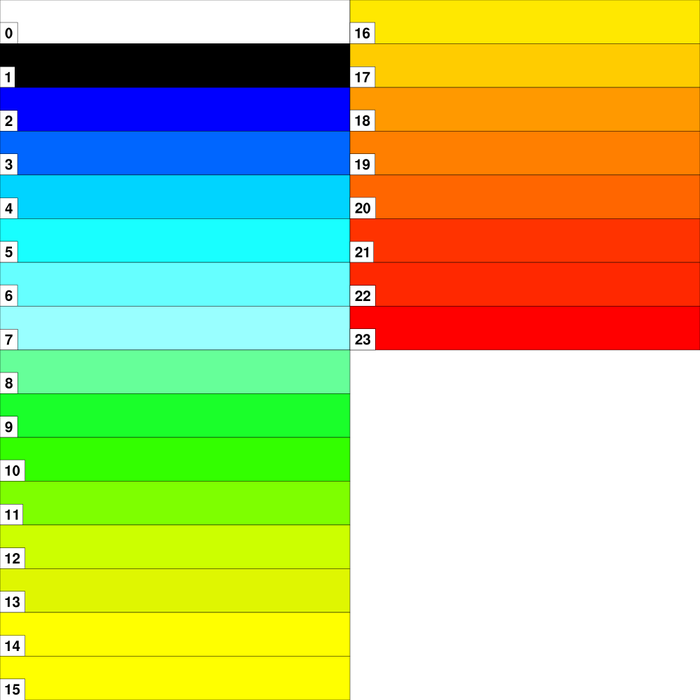 This is useful for debugging or color selection purposes. 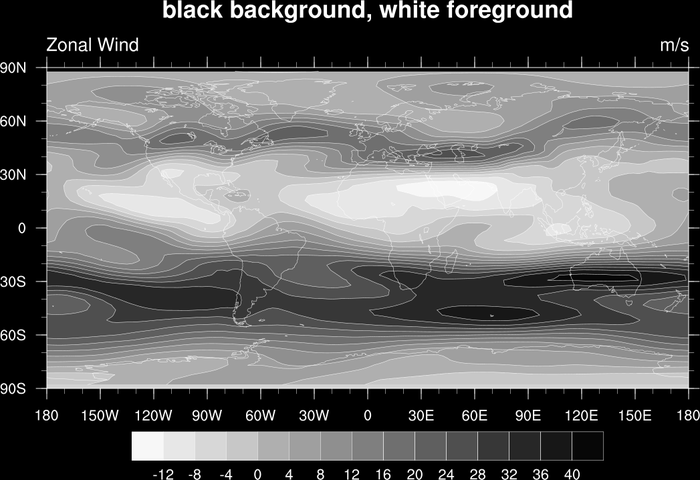 Also demonstrates how to reverse a colormap. gsn_draw_colormap and gsn_reverse_colormap draws the colormap and reverse a colormap respectively. color_9.ncl / color_9_new.ncl: Merges two colormaps using gsn_merge_colormaps, so that multiple colormaps can be used on the same workstation. See the color_9_new.ncl script for an example of using cnFillPalette. color_10.ncl: I randomly chose colors from the master list of named colors, and placed them in my own RGB file (test_rgb.txt) to create a personalized colormap. RGBtoCmap is the function that will take a text file of RGB triplets and convert them into an NCL colormap. 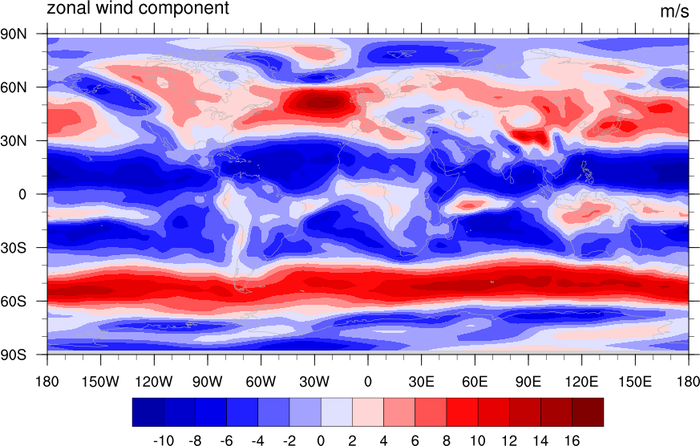 You can then use gsn_draw_colormap to preview what your colormap looks like. 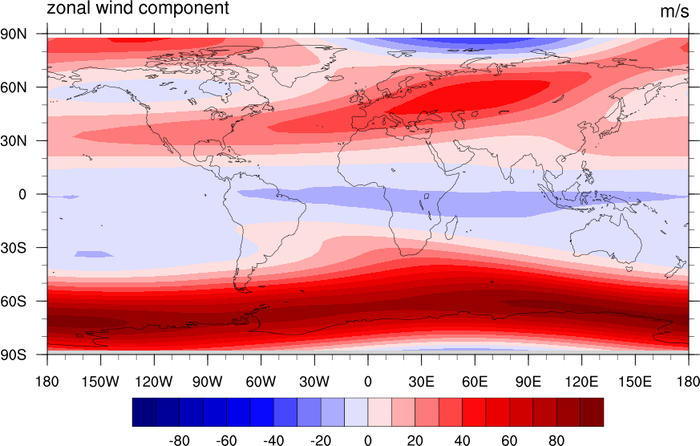 This is an easy way to develop your own colormaps. Note: a user reported a noticeable degradation in the color quality when using the old postscript and pdf drivers along with the CMYK option. He said he's been able to submit RGB figures to various journals for the last few years, and never had a problem. If you have to send in CMYK graphics, then submit the figures as RGB (which is the default in NCL), and then use an external package like Illustrator to convert them to CMYK. 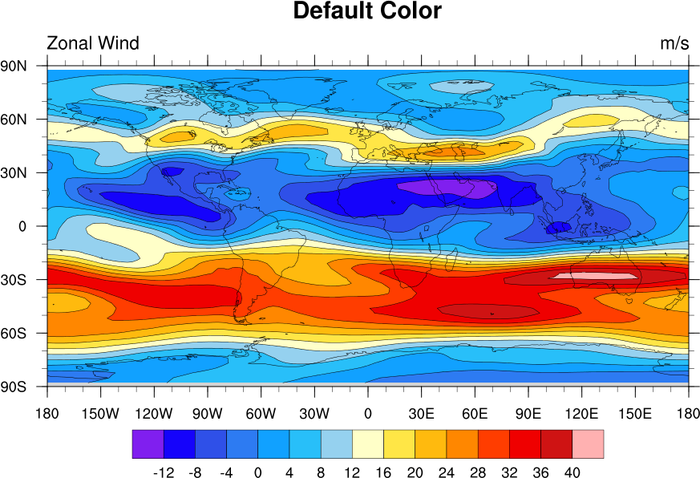 Second note: this example shows how to subselect a color map using the "old style" resource gsnSpreadColors. gsnSpreadColorStart allows you to choose which color to start your color table at while gsnSpreadColorEnd allows you to choose which color to end your color table. 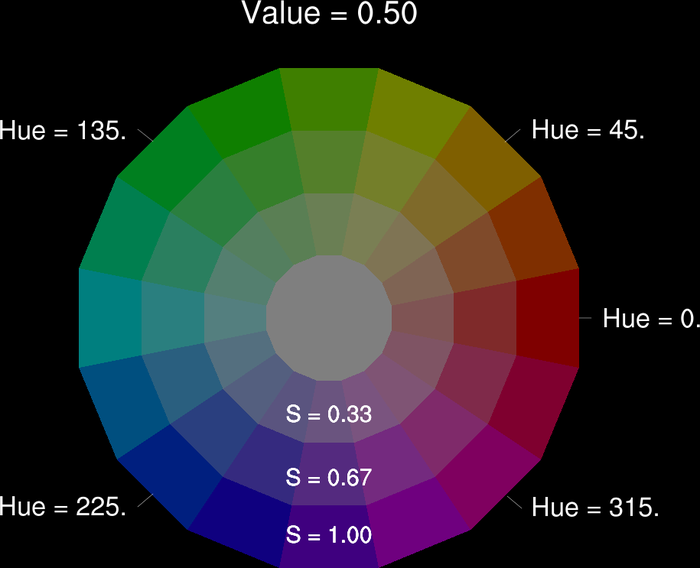 color_12.ncl: Demonstrates choosing a colormap based upon the specification of an array of RGB triplets. The array must be a float array, and must be normalized by dividing by 255. 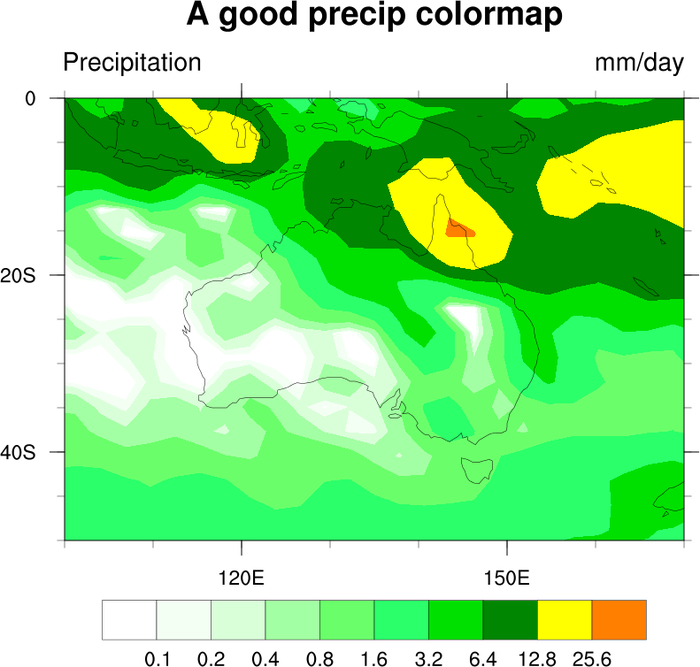 This particular color map is specifically used for precipitation plots. color_13.ncl: Demonstrates how to convert an array of colors in HSV format to RGB format. hsvrgb is the function that does the conversion. See the script for usage. hsvrgb, available in version 4.3.2 or later, replaces the obsolete function hsv2rgb. 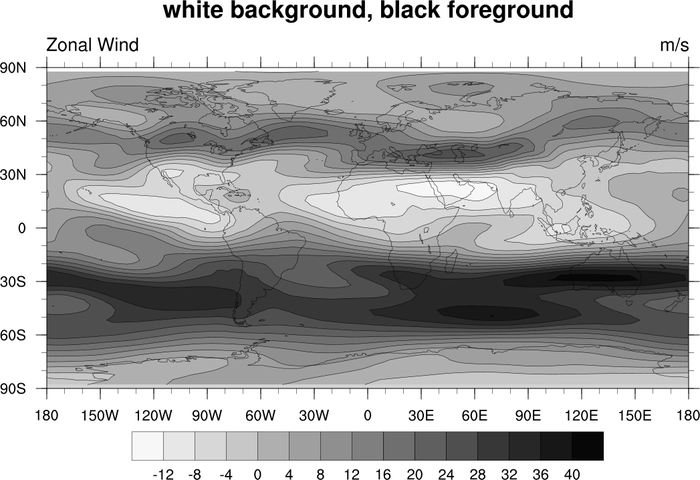 color_14.ncl: Demonstrates the use of a grayscale color table (gsltod). The second frame shows how to change the background and foreground colors to black and white. Note that in order to change the foreground and background colors, you must do this using workstation resources: wkForegroundColor and wkBackgroundColor. color_15.ncl: Uses symMinMaxPlt to automatically calculate symmetric min/max/int values for use with a symmetric colormap. This is useful when running a script that plots multiple variables of varying magnitudes. color_16.ncl / color_16_old.ncl: Uses read_colormap_file to retrieve a colormap and subset it. The color_16_old.ncl script shows the old way of doing this using gsn_retrieve_colormap. color_17.ncl: Draws the given list of named colors using gsn_draw_named_colors. This procedure internally sets the colormap to the given list of named colors, and then sets the color map back to the original color map before exiting. It is mostly useful for debugging purposes. color_18.ncl: Uses hsvrgb to draw some illustrative HSV color wheels. 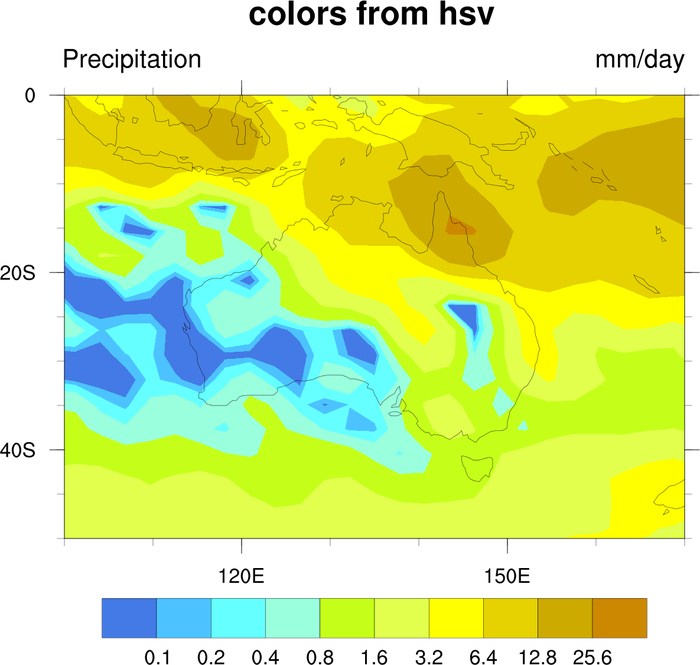 hsvrgb, available in version 4.3.2 and later, replaces the obsolete function hsv2rgb. color_19.ncl: Shows how to change a color in an existing color map. 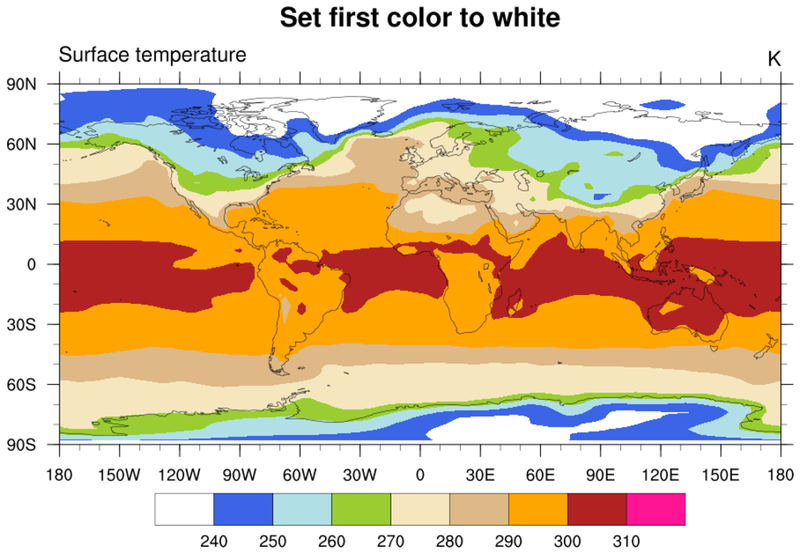 In this case, the amwg color map is read in using read_colormap_file, and the first color is changed to white. 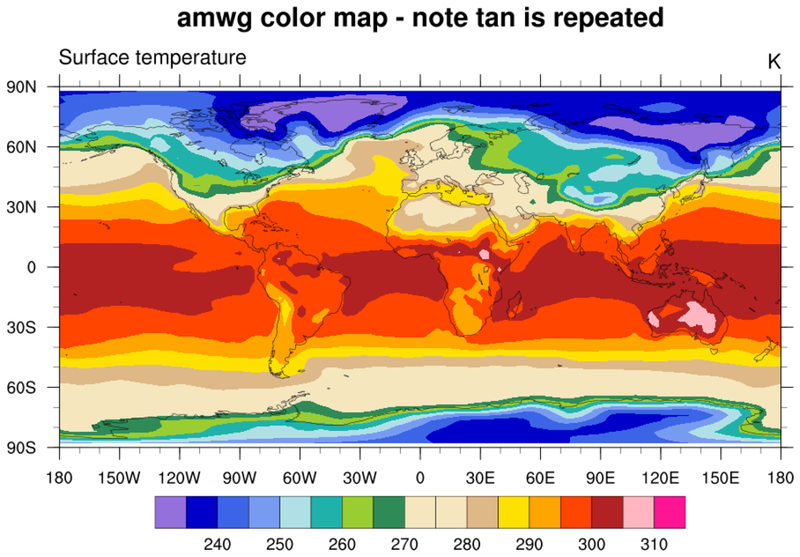 The amwg color map is relatively small (16 colors). 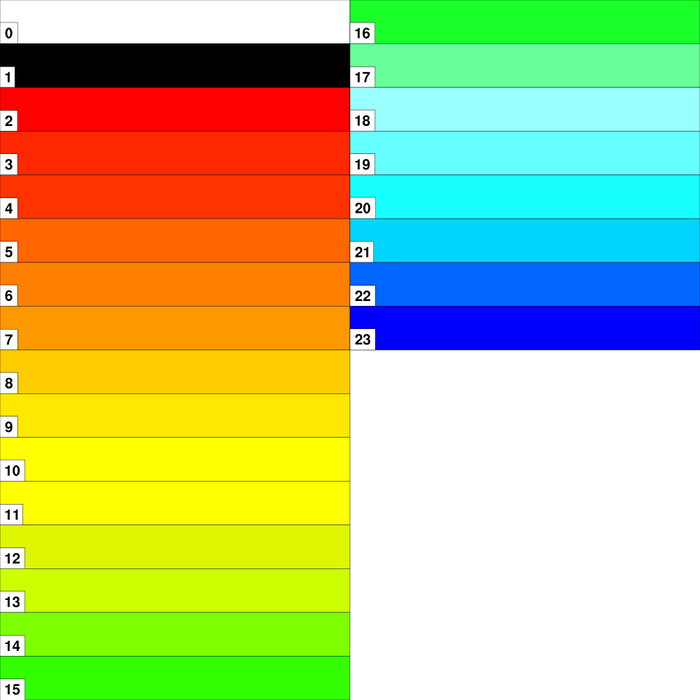 Note that in the first frame NCL chose 18 contour levels, and hence needs 17 colors to represent them. 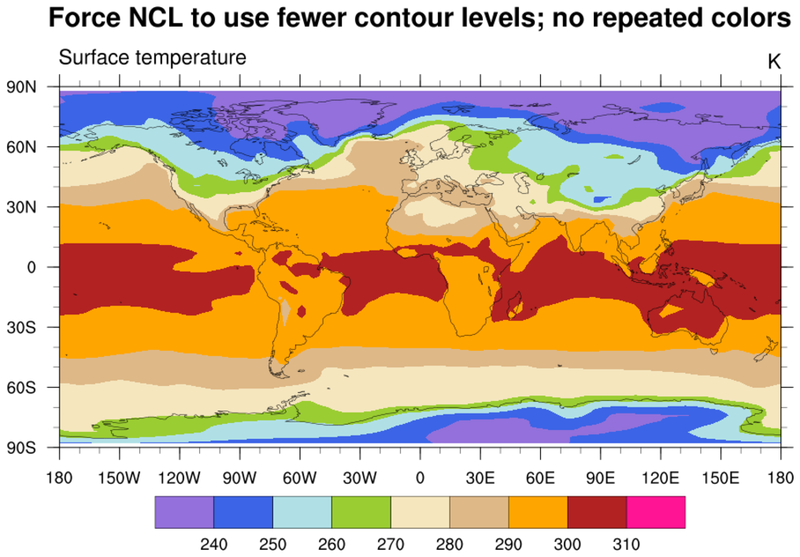 What happens in this case is that NCL will start repeating some of the colors; in this case, the tan color between levels 270 and 280. To force NCL to choose fewer contour levels, you can set cnMaxLevelCount to ncolors-1, where ncolors is the number of colors in your color table (not counting the background and foreground colors).